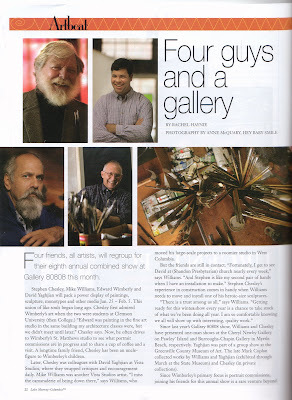 Four friends, all artists, will regroup for their eight annual combined show at Gallery 80808 this month. Stephen Chesley, Mike Williams, Edward Wimberly and David Yaghjian will pack a power display of paintings, sculptures, monotypes and other media Jan. 25 – Feb. 5. This union of like souls began long ago. Chesley first admired Wimberly’s art when the two were students at Clemson University (then College.) “Edward was painting in the fine art studio in the same building my architecture classes were, but we didn’t meet until later,” Chesley says. Now, he often drives to Wimberly’s St. Matthews studio to see what portrait commissions are in progress and to share a cup of coffee and a visit. A longtime family friend, Chesley has been an uncle-figure to Wimberley’s children. Later, Chesley was colleagues with David Yaghjian at Vista Studios, where they swapped critiques and encouragement daily. Mike Williams was another Vista Studios artist. “I miss the camaraderie of being down there,” says Williams, who moved his large-scale projects to a roomier studio in West Columbia. But the friends are still in contact. “Fortunately, I get to see David at (Shandon Presbyterian) church nearly every week,” says Williams. “And Stephen is like my second pair of hands when I have an installation to make.” Stephen Chesley’s experience in construction comes in handy when Williams needs to move and install one of his heroic-size sculptures. Since last year’s Gallery 80808 show, Williams and Chesley have presented one-man shows at the Cheryl Newby Gallery on Pawleys’ Island and Burroughs-Chapin Gallery in Myrtle Beach, respectively. 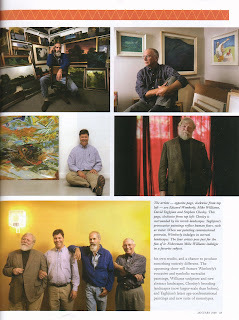 Yaghjian was part of a group show at the Greenville County Museum of Art. The late Mark Coplan collected works by Williams and Yaghjian (exhibited through March at the State Museum) and Chesley (in private collections). Since Wimberley’s primary focus is portrait commissions, joing his friends for this annual show is a rare venture beyond his own studio, and a chance to produce something entirely different. The upcoming show will feature Wimberly’s evocative and symbolic surrealist paintings, Williams sculpture and new abstract landscapes, Chesley’s brooding landscapes (now larger-scale than before), and Yaghjian’s latest age-confrontational paintings and new suite of monotypes. To visit the website for Gallery 80808/Vista Studios, click here.